Even when Interpol tries to change up the formula, they can't help but sound like themselves on Marauder. Antics was the difficult second album. Our Love to Admire was a bid for the big leagues, Capitol Records to be specific. The self-titled Interpol saw the band return to Matador and was the last release to feature their original bassist Carlos Dengler. Now with Marauder, the New York trio known as Interpol have reached another career milestone: being loud. According to press material, Interpol rehearsals for the Marauder songs got so loud that someone called the police on them. If you are wondering if such a raw beginning managed to find its way into the final product, just be warned that Marauder is still very much an Interpol album. It bears all of the hallmarks of the band's previous five albums; Daniel Kessler and Paul Bank's streamlined guitar riffs, Sam Fogarino's brisk, airtight timekeeping, and Bank's strained baritone shouts that resemble Matthew Sweet fronting Echo & the Bunnymen. If you're a glass-half-empty connoisseur of music, you will agree that Interpol are plowing the same row they have been since their 2002 debut. A more generous and optimistic listener would probably slap my hand and say something along the lines of "Hey! It works for them!" But as I play Marauder over and over again and again, I get the uneasy feeling that the band's window of opportunity for a watershed moment may have shut some time ago without anyone noticing, broken kick drum heads be damned (something that allegedly occurred during those loud rehearsals). Marauder is the first Interpol album in 11 years to seek the help of an outside producer. Dave Fridmann decided to bypass the ProTools process and record direct to tape, thereby imposing a limit on the number of tracks you can pile onto a final mix. That may sound like a mere technicality, but the average person should be able to detect just how close all of the instruments are to clipping on "Flight of Fancy", a song that begins with Banks rhetorically asking "Who reigns in this silence?" "Number 10" also sounds like it's on the verge of breaking up the sound. What starts with one of the guitarists sending out a simple motif to dance among its own echo eventually gets steamrolled by a whole new tempo and dynamic, a perfect place for cryptic lyrics like "Won't seek replacements / My ballerina / There's many faces in my gallery." Banks isn't above being more direct. The single "The Rover" gets to the heart of the matter of dangerous cult leaders. You can hear Fogarino pounding his kit with more force, searching for new ways to make the old post-punk rollick. "It's my way or they all leave / Says the rover," sings Banks in the roaring chorus, sounding like he's trying not to drown in all the fury. Foragarino fastens a swift boom-chick beat to "Complications", giving Kessler and Banks a chance to play around with their chromatics. This track and "Mountain Child" also showcase Paul Banks' attitude towards playing the bass. The funky octaves on the latter prove that he's no longer playing the instrument because he has to, but because he wants to. 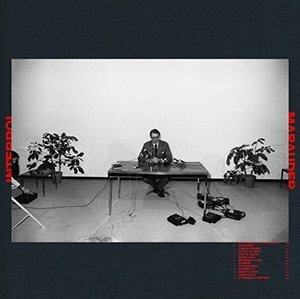 But a new producer and a photo of Elliot Richardson on the cover don't go very far in differentiating Marauder from other Interpol albums. It is, once again, the sound of a band coming within scraping distance of their potential. And after so many competently executed scrapes in a row, things tend to go numb. Marauder does have a small treat though, in the form of two instrumental interludes. They're only about a minute apiece, but they convince me that Interpol could whip up a fine instrumental ambient album if given a chance. I would pay for that.